Blessed To Be Stressed will be available through our webshop now and at stores all over Europe in mid September. “Mediocrity Is King” takes a wider swipe, at our culture’s hyper-drive addiction to celebrity artifice and rampant consumerism. But like “Everything Is Gonna Be All Right,” a rocking celebration of the simple joys of life, it’s done with Thorn’s unflagging belief in the inherent goodness of the human heart. “I don’t think I could have written anthemic songs like this if I hadn’t made my last album,” Thorn says of 2012’s What the Hell Is Goin’ On? Like 2010’s autobiographical Pimps & Preachers, it was among its year’s most played CDs on Americana radio and contributed to Thorn’s rapidly growing fan base. And Thorn followed that airplay success with his AAA radio hit version of “Doctor My Eyes” from April 2014’s Looking Into You: A Tribute to Jackson Browne. The latter also features Grammy winners Bruce Springsteen, Bonnie Raitt, Lyle Lovett, the Indigo Girls, Lucinda Williams, Keb’ Mo’, Ben Harper and Don Henley. What the Hell Is Goin’ On? was also Thorn’s first set of songs written by other artists, borrowed from the catalogs of Allen Toussaint, Buddy and Julie Miller, and Rick Danko, among others. It helps that those big vocal hooks on Too Blessed To Be Stressed are being reinforced by the sound of Thorn’s flexible and dynamic band, as they have been doing for years in concert. During their two decades in the club, theater and festival trenches, the four-piece and their frontman have garnered a reputation for shows that ricochet from humor to poignancy to knock-out rock ’n’ roll. Guitarist Bill Hinds is the perfect, edgy foil for Thorn’s warm, laconic salt o’ the earth delivery — a veritable living library of glowing tones, sultry slide and sonic invention. Keyboardist Michael “Dr. Love” Graham displays a gift for melody that reinforces Thorn’s hooks while creating his own impact, and helps expand the group’s rhythmic force. Meanwhile drummer Jeffrey Perkins and bassist Ralph Friedrichsen are a force, propelling every tune with just the right amount of up-tempo power or deep-in-the-groove restraint. At age 17, Thorn met songwriter Billy Maddox, who became his friend and mentor. It would take several detours — working in a furniture factory, boxing, jumping out of airplanes — until Thorn committed to the singer-songwriter’s life. But through it all he and Maddox remained friends, and Maddox became Thorn’s songwriting partner and co-producer. 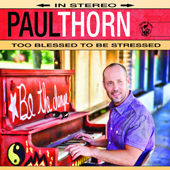 That’s really Thorn’s mission for Too Blessed To Be Stressed, which can be heard as a running conversation about life between Thorn and listeners — a conversation leavened with gentle insights, small inspirations and plenty of cheer.